This is a comparison of mammalian dental patterns showing the difference in regionalization of tooth morphology. (A) Mus musculus (B) Sus scrofa (picture is of an immature pig with an unerupted M3) and (C) Stenella attenuata. Credit: Armfield et al. Whales are mammals, but they don't look like the mammals living around us, as they have a triangular fluke for tail, no hind legs and no body hair. And inside their mouths, their teeth are unfamiliar too – being much simpler and 'peg like'. A multidisciplinary team of researchers have now married together the fossil record and the embryonic development process to investigate how the whale got its teeth. Most mammals have four kinds of teeth, each shaped for specific tasks. In most mammals there are wedge-shaped incisors, a pointy canine, and premolars and molars with bumps and valleys that fit together like a mortar and pestle when you chew. Not all whales have teeth, but those that do, such as killer whales, have rows of simple peg like teeth, each one looking the same as the next. Whales use this spiked row of teeth to grab prey, but unlike other mammals, whales do not chew. In a new study published today in the open access journal PeerJ, Brooke Armfield and colleagues investigated the developmental processes that cause the teeth of dolphins, whales' smaller cousins, to be different, and tracked the evolutionary progression of their unique dentition across the fossil record. Whales evolved from land mammals and so Armfield and co-workers first went to the fossil record to trace when and how whales evolved their simple teeth. The fossil record shows that, 48 million years ago, whales had the same four kinds of teeth just like most other mammals. Gradually, the teeth of whales became simpler and acquired their characteristic peg-like appearance around 30 million years ago, well after the time that they had acquired an array of adaptations for living in the water. Next, Armfield and her colleagues explored just how teeth are shaped during development. Specific proteins in the embryo cause developing teeth to grow into certain shapes. Armfield and colleagues zeroed in on two proteins, BMP4 (Bone Morphogenetic Protein 4) and FGF8 (Fibroblast Growth Factor 8). BMP4 expression leads to teeth developing into simple prongs, and this occurs near the tip of the jaws, where the incisors form. Prior to teeth forming in the embryo, FGF8 expression in the back of the jaw leads to development of molar teeth with their complex hills and valleys in mice and other mammals. Armfield and her co-workers studied FGF8 and BMP4 in pig embryos, relatives of whales and dolphins. 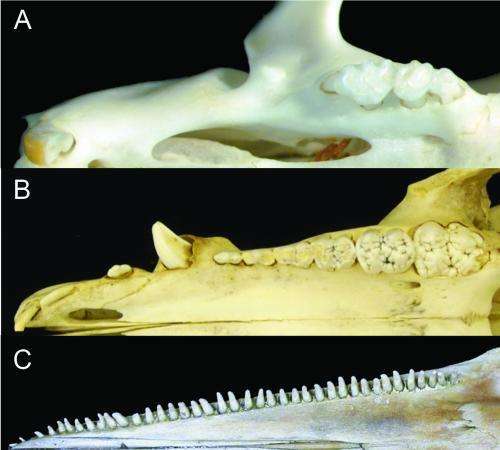 Pigs have the four typical types of teeth, and, sure enough, the two proteins are distributed in the same way as they are in other mammals, showing that whales' ancestors likely had this distribution of gene expression too. Next, the authors moved on to examine dolphin embryos. Here, the pattern was different: FGF8 is present in the back part of the jaw, but BMP4 is present along the entire length of the jaw, including where FGF8 is found. The authors hypothesize that the overlapping presence of BMP4 in these new areas causes the teeth all along the jaw to be simple in shape, like incisors, and to be similar to each other. Interestingly, other researchers had shown that in mouse embryos in which BMP4 is experimentally introduced in the back of the jaw, the back teeth also take on this simplified appearance. "It is exciting to identify a molecular change that occurred in nature and that so dramatically influenced the way in which a mammal can thrive in the ocean and to then trace the evolution of that change in the fossil record," says Armfield. "The simple shift in the location of proteins that influence tooth shape found in whales may help us to better understand how mammals evolved their complex tooth in the first place." Says co-author Thewissen: "This shows that major changes to the design of an animal can result from small changes in early development, by simply shifting the region where an already existing protein occurs. It's a beautiful, detailed example of a small developmental change having a big effect in evolution."